Our remit was tricky but our solution and implementation succeeded remarkably – a discretionary diversified trading system with automatic trade management alongside a fully automated fund of funds portfolio trading system- allows a small team of experienced traders to flick through and see at a glance where attention should be paid via NinjaTrader’s Market Analyzer with a simple system of colors and multi-time frame and system confluence – then to drill down into the context and view from high up year down into close inspection end of day and if required intra-day to plan trades, position compounding or scale out and exit points. on top of this imagine you want bracket orders and OCO order take care of compounding limits or stop entries for deferred execution or cancellation, stats and indicative risk for fund of fund asset management approaches – allowing true position and swing trading – over several months if need be…with automatic intelligent trade management which can recover all orders and continue with positions in case of a restart or “cancel all” which we did have when MacQuarie was taken over by Bell Potter! On top of this cloud stats inline, settings and control via web/tablet/desktop and more and you are getting close to what has been developed for a 3 year project starting out in NinjaTrader 7 and now finishing in glorious NinjaTrader 8! This system is way beyond anything NinjaTrader 8 was created for and simply the most advanced system eve built for NinjaTrader and any other retail platform – this is suitable for commercial trading and hedge funds when supported by the CPC Simba framework, data replication and automation at the server task scheduling batch level. The ability for the server to reboot from power out or restart and to login, start the platform and load all the data on the correct connections for each exchange, load the workspaces and then examine all positions and order and make sure all is correct – and continue is a routine task – including rollovers and exits – rolling positions into new contracts, restart on crash on disconnect and not losing context of orders positions or statisitics… Cloud and WebAPI control via mutliple browser based devices.! Weekly routines shutdown, restart, patch, load data and get ready for the open are all batch and scheduled tasks – external and internal to NinjaTrader 8 – Thank you to NinjaTrader! It is proposed later CPC and MicroTrends may team up in fact supply other hedge Funds with this system – time will tell we still have 2019 to complete and a mass of development components ahead to implement and validate.! This would be around the 10K USD per month – price mark an be suitable for 10Mil USD and above minimum account size. 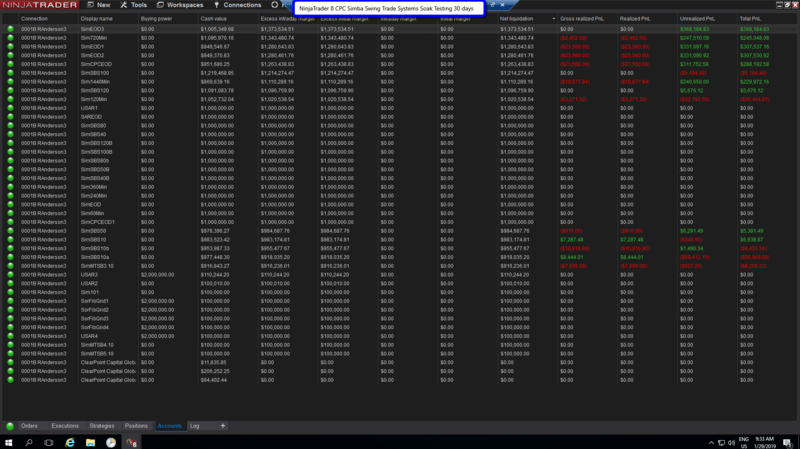 So if you are wondering this is what is keeping us so busy and why we needed a trusted ethical real deal trader to deal with the retail trading products – please see AlgoFuturesTrader – here in fact you will get access to some of the tools i created and used in this hedge fund project for swing trading.